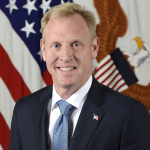 Acting Defense Secretary and 2019 Wash100 Award recipient Patrick Shanahan said the Department of Defense’s objective is to accelerate the “margin of dominance” in space to protect the country’s $19 trillion economy and military systems, the DoD website reported Wednesday. Shanahan said Wednesday at the Center for Strategic and International Studies that DoD’s reorganization efforts to recognize space as a warfighting domain supports the goal and involves the creation of a new Space Force within the Department of the Air Force, development of a new Space Command and formation of a new Space Development Agency. Air Force Secretary Heather Wilson said the service has received congressional backing to continue its space mission amid the continued push of the Trump administration to establish a Space Force, Space News reported Monday. Gen. Joseph Dunford, chairman of the Joint Chiefs of Staff, has said he intends to arrange tabletop exercises in the fall of this year to help the Defense Department establish and explore the “war fighting attributes” of a new combatant command for space, SpaceNews reported Wednesday. Dunford wrote a memo to Air Force Secretary Heather Wilson to address the latter’s concerns about U.S. Space Command’s acquisition responsibilities. Former Deputy Secretary of Defense Robert Work has said creating a new Space Command under the Pentagon will help address concerns about President Trump’s idea to establish a Space Force, Space News reported Monday. Defense Secretary James Mattis has said the Defense Department has initiated steps to establish a space-focused military command as part of a reorganization plan, SpaceNews reported Tuesday. He said Tuesday at the Pentagon that DoD will use existing resources and personnel to fund and operate the proposed space command, which will be led by a four-star general.